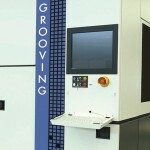 Large variety of grooving widths. Ranging from 10um up to 100um or more due to wide selection of multi beam matrix configurations. ASMPT is the inventor of multi beam semiconductor dicing. With this experience we have developed a V-DOE dicing technology which allows full cut dicing of Low-K (thin) Si wafers including DAF or FOW while achieving high die strength (450-500Mpa) with a good quality and low CoO. 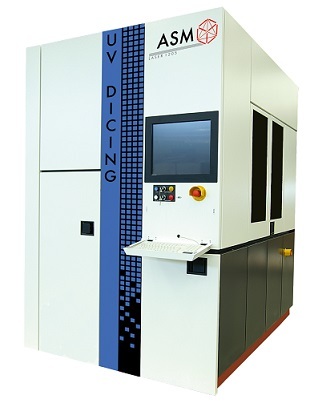 The V-DOE process allows customers to dice through the full stack of materials using a single process step. 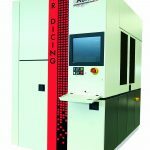 No complicated and costly process flows required such as with DBG or other Hybrid dicing technologies. The unique slider concept (wafer stepper concept) allows high accuracy and reproducibility. Ability to dice substrate material as well as DAF or FOW. Thickness ranging from 10um up to 200um. ASMPT is the inventor of multi beam semiconductor dicing. With more than 20 years of multi beam laser process experience in high volume manufacturing many billions of parts have been processed. Utilizing the strength of the multi beam process, low power per beam but using many beam to allow high material removal rate with a small (<3um) heat affected zone. The unique slider concept (wafer stepper concept) allows high accuracy and reproducibility. The IR multi beam laser process has proven its value in semiconductor wafer singulations and enabled the ongoing trend of thinner (more fragile) devices and shrinking the dicing street resulting in more die per wafer. Typical dicing thickness ranging from 10um up to 250um.